One of the goals of A&F Voice is to improve communication between staff and senior management by establishing effective communication strategies. So, as of July 2013, we have twice asked for your anonymous input to help us better know what you want. We first asked for your input on the recognition-and-rewards program. You gave feedback via an email in November 2013. 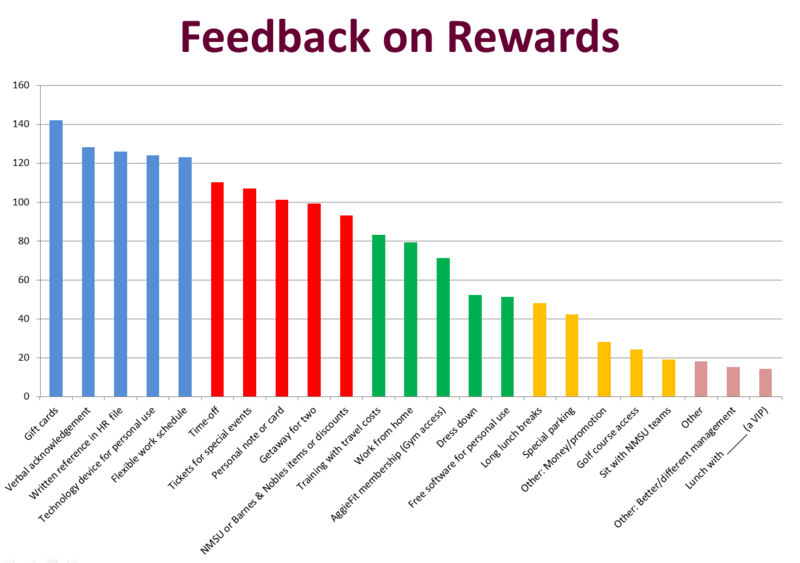 These results helped us design the rewards program. Click the link below to expand/collapse this information. Click any thumbnail to view the full-sized image. During the A&F Semi-annual Meeting (July 6 and 17, 2014), the Voice asked for feedback from the staff on eleven questions related to your employment at NMSU. 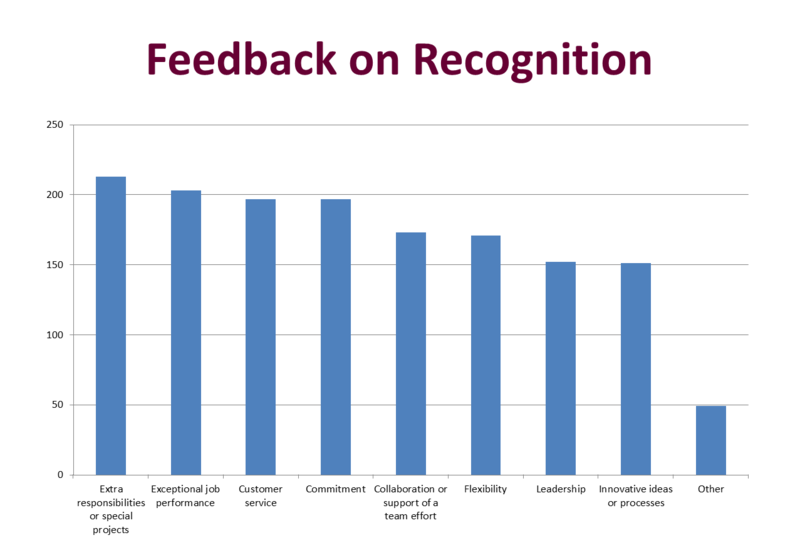 These results will help us communicate staff attitude and desires to the A&F Leadership Team. We put each response into one or more categories and subcategories, based on the topic of the response. We also categorized each response by whether it was a positive, negative, or neutral comment. So, for example, is there is a response about a manager’s good leadership style that also mentions the lack of flex time, then that response would be categorized twice; once as a positive comment in Management/Leadership (the category and subcategory) and another as a negative comment for Benefits/Flex Time. After categorizing the comments, we ended up with 1621 categorized items. The charts on this page are taken from these responses. The raw data used to compile the results are in this spreadsheet. The charts on this page are taken from these responses. The raw data used to compile the results are in this pdf. This first chart does not include the question number or whether the response was positive or negative, so it primarily shows what topics were commented on. We see this as an indicator of what staff feels is important. It is sorted by the number of responses. This second chart is similar to the first, but it includes whether the comment was a plus, minus, or neutral.